Chinese-made subway trains in Singapore have cracks in their car bodies and key structural components, resulting in 35 trains being shipped back to their manufacturer in Qingdao for replacement, FactWire can reveal. 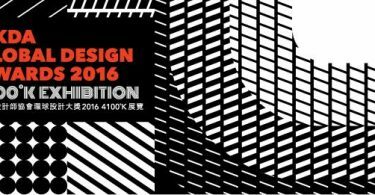 Details of the defects and the recalls have been kept secret in both Singapore and China. The same mainland manufacturer is responsible for manufacturing nine trains for the Guangzhou-Shenzhen-Hong Kong Express Rail Link (XLR) and 93 trains for the Mass Transit Railway Corporation’s (MTR Corporation) four urban lines. Trains wrapped in green covering could be seen inside the factory in Chengyang district. Photo: FactWire. A source from the mainland railway industry told FactWire that Singapore’s subway operator SMRT Trains Ltd (SMRT) was secretly shipping defective trains back to mainland China for replacement and repair by manufacturer CSR Sifang Locomotive & Rolling Stock Company Ltd (CSR Sifang). 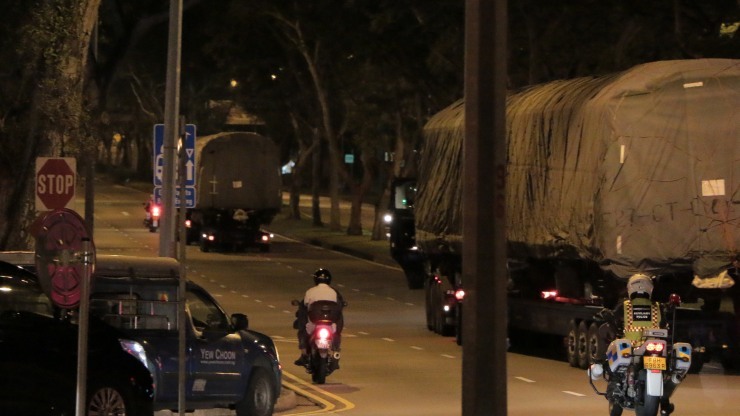 According to sources, the defective trains are being stored at SMRT’s Bishan Depot. After 1am on June 12, FactWire reporters witnessed two train cars wrapped in green covering being moved out of the depot. Each of the two covered train cars were more than 20m long. They were placed on large dollies used for transporting train cars and were towed away by cargo trucks, led by police cars and construction vehicles. 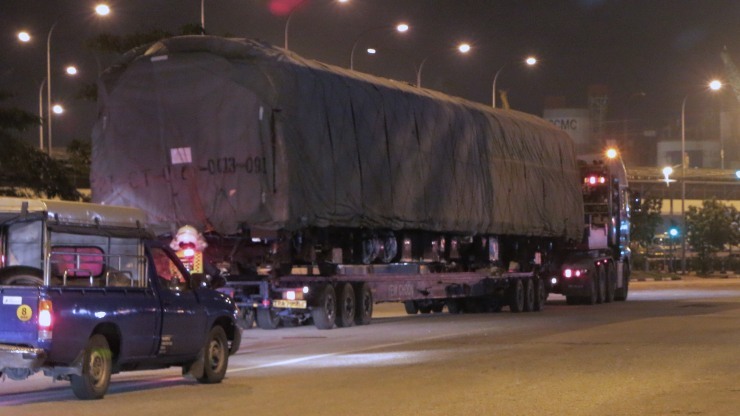 At approximately 3am, the two train cars arrived at Jurong Port, located in Singapore’s western industrial area. Using a drone camera, reporters discovered that six train cars had already been placed in one corner of the port. Cranes, derricks, and other large machines believed to be used for lifting trains were situated nearby. 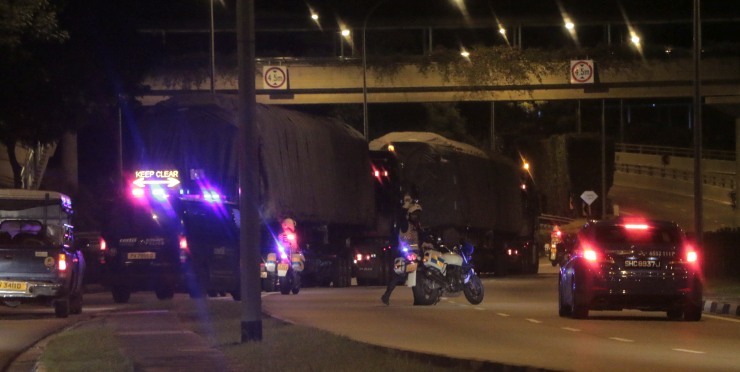 The two train cars entered Jurong Port in Singapore’s western industrial area. Photo: FactWire. Another source from the mainland railway industry confirmed that the train spotted by FactWire reporters was to be taken by cargo ship to Qingdao, with the voyage taking more than 10 days. 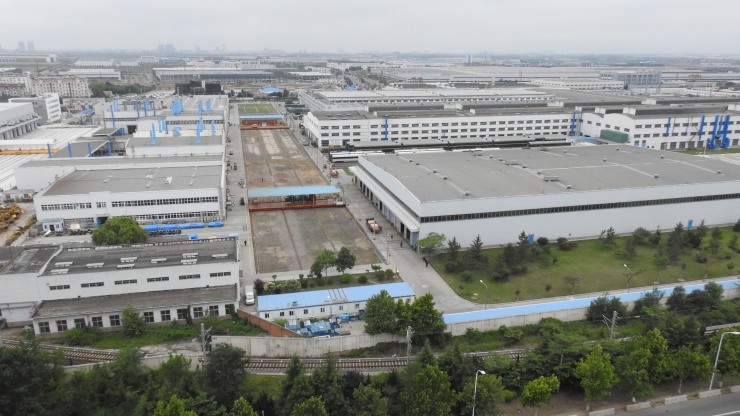 In late June, reporters went to the factory of train manufacturer CSR Sifang, located in Qingdao’s Chengyang district. Two of CSR Sifang’s staff confirmed that the train had arrived at the factory on June 25 from Singapore. 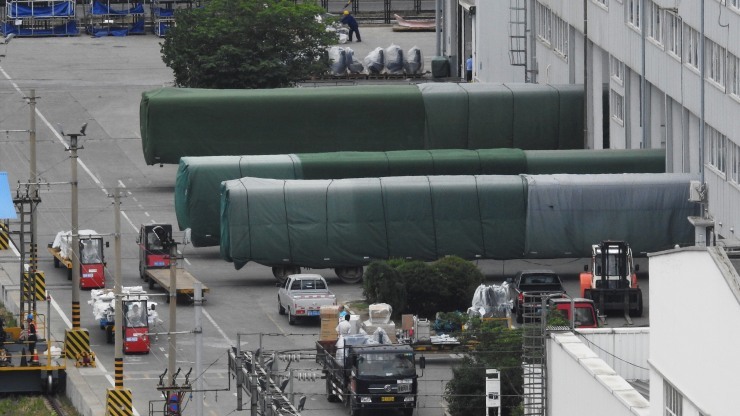 Outside the factory, reporters saw trains wrapped in green covering identical to the kind seen in Singapore. Some of the green covering had “E27” printed on it, the same marking seen on the covering of the trains in Singapore. The defective trains belong to the SMRT’s C151A series. In May 2009, Singapore’s Land Transport Authority awarded the manufacturing contract of the C151A trains to a consortium consisting of Japanese company Kawasaki Heavy Industries Rolling Stock Company (Kawasaki Heavy Industries), its Singapore subsidiary, and CSR Sifang. 22 trains were ordered, totalling S$368 million, equivalent to approximately HK$2.1 billion. Singapore later ordered an extra 13 trains of the same series in 2011. From May 2011 to 2014, 35 trains were shipped to Singapore and put into service. According to a 2009 press release by Kawasaki Heavy Industries, it was responsible for overseeing the project, designing and manufacturing the train bogies, and buying the major train components. 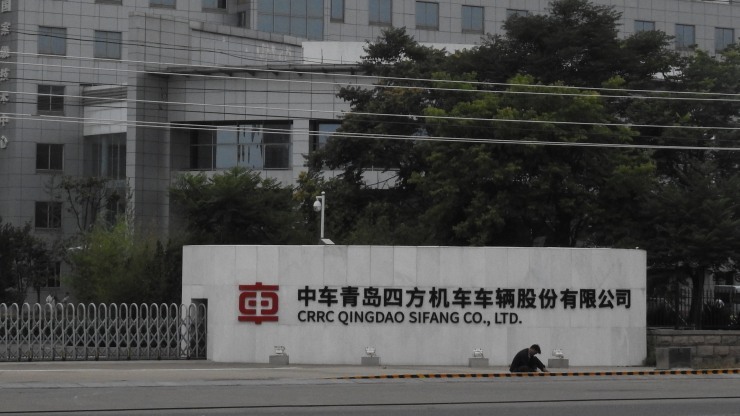 The press release also states that CSR Sifang was responsible for manufacturing other parts of the train car body, assembling the trains, and conducting factory tests. Another press release by CSR Sifang from 2009 describes the project as “the first successful cooperation of CSR Sifang with the world’s advanced subway vehicle enterprises in the international subway vehicle market”. In the same year, chairman of CSR Corporation Limited Zhao Xiaogang stated that the Singapore railway contract bid submitted by Kawasaki Heavy Industries-CSR Sifang was the second lowest, with the lowest bid being submitted by a South Korean company. According to Zhao, Singaporean authorities chose to award the bid to Kawasaki Heavy Industries-CSR Sifang after a comprehensive evaluation because product quality was important to them. 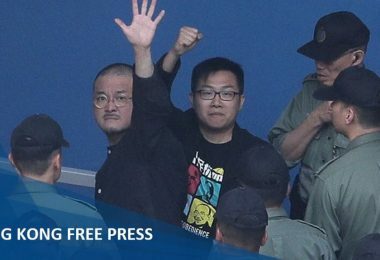 However, multiple sources from mainland China and Singapore have confirmed to FactWire that problems have been found with C151A trains since they began service in 2011. Sources said the trains are of poor quality and that the glass next to passenger seats has repeatedly shattered due to shoddy workmanship. In 2011, one of the trains’ Chinese-made uninterruptible power supply batteries exploded during repair. While there were no injuries, Kawasaki Heavy Industries-CSR Sifang replaced all of the batteries made in China with ones made in Germany. In December 2011, serious malfunctions occurred on the SMRT’s North South Line, which the SMRT suspected were caused by C151A trains. A subcontractor responsible for supplying train components to CSR Sifang admitted to FactWire that after the malfunctions, SMRT significantly reduced the frequency of C151A trains and asked to delay payment for extra trains of the same series, greatly impacting the subcontractor’s cash flow. C151, the predecessor of C151A, has been manufactured by Kawasaki Heavy Industries in Japan since the 1980s. The two models share similar designs, but the C151 has been used by the SMRT since 1987 without experiencing cracks. Mainland sources revealed that some of the C151A trains manufactured by CSR Sifang were found to have impurities in their aluminium train car bodies, a very likely cause of the cracks now found in the trains. Former Kowloon-Canton Railway Corporation acting chief executive officer Samuel Lai Man-hay said train components usually cracked due to age. A source from CSR Sifang told FactWire that at least five trains had been replaced since last year. They also said Kawasaki Heavy Industries was taking over the manufacturing of the flawed aluminium train car body, while CSR Sifang is responsible for reassembling the train cars. Arriving in Qingdao after half a month of shipping, each train car is disassembled and its parts refitted into the new car body. 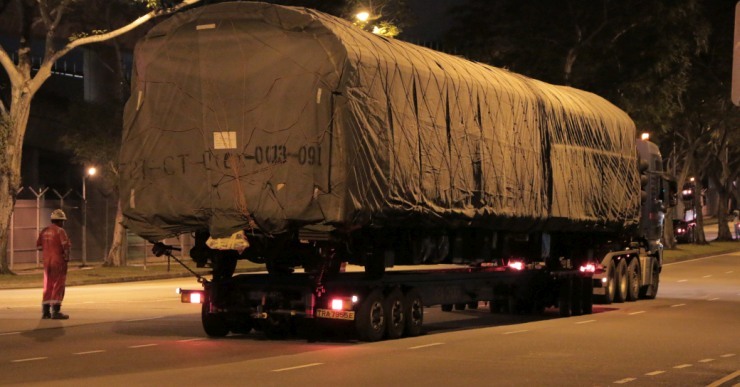 Tests are then conducted before the new trains are shipped back to Singapore, completing the four-month repair process. The original train car bodies must be discarded, resulting in tremendous losses for both companies. 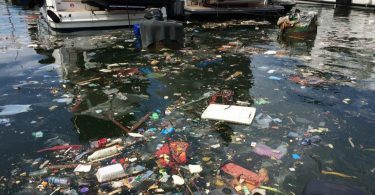 SMRT, Singapore’s Land Transport Authority, and CRRC Corporation Limited, CSR Sifang’s parent company, did not respond to requests for comment. In recent years, Hong Kong’s MTR Corporation has made many purchases of Chinese-made trains, including several deals with CSR Sifang. In March 2012, after its successful HK$1.74 billion bid, CSR Sifang was awarded the XLR contract to supply nine CRH380A trains, each containing eight train cars. With three of the trains already completed, the first batch of trains are due to be shipped later this year. In July 2015, MTR Corporation announced a HK$6 billion contract with CSR Sifang to buy 93 French-designed trains of eight train cars each to fully replace the first generation, British-made trains now serving the Kwun Tong, Tsuen Wan, Tseung Kwan O, and Island Lines. According to MTR Corporation’s 2015 business overview, 115 trains operate in the urban lines during peak hours, meaning the new trains will make up over 70% of urban line trains in the future. The contract is MTR Corporation’s largest order of new trains and also the largest order of trains in the mainland. This price is over 40% cheaper than the first batch of mainland-manufactured trains and SMRT’s C151A trains. 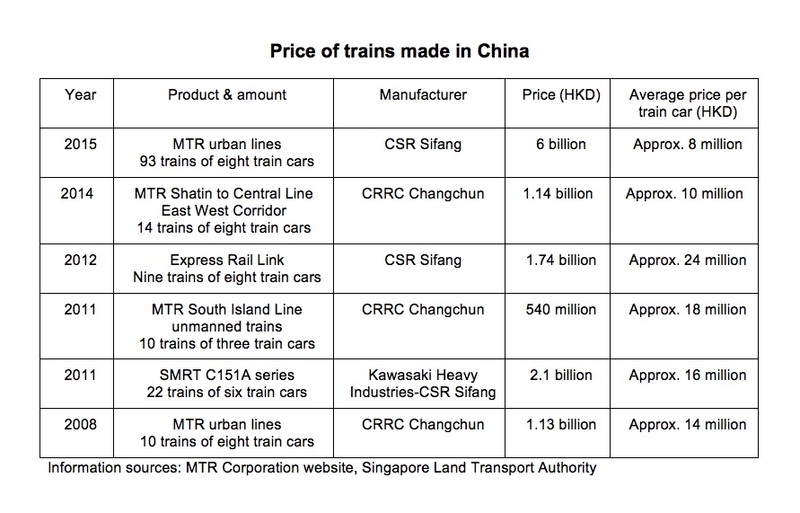 Information records show that MTR Corporation purchased 10 urban line trains of eight train cars each from CRRC Changchun Railway Vehicles Company Ltd. (CRRC Changchun) for HK$1.1 billion, averaging HK$14 million per train car. SMRT’s defective C151A trains have six train cars each, averaging HK$16 million per train car.